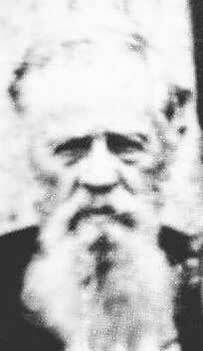 Jonathan Marion Barton was born 26 December 1830. He was married to Hannah Ann Blackstock. He died on 17 April 1910 in Winston Co., AL. In a claim filed by Jonathan Barton with the Southern Claims Commission after the war, he stated, "I was threatened, shot at, and molested by the rebel soldiers on account of my union principals or sentiments. They burned my still, took one mare, two mules, and a buggy, knocked the heads out of my whikey barrels after taking what they wanted, and turned out the balance. They threatened to kill me and burn my dwelling if I did not come in and give up to them. The still house was burned and the mare and two mules and buggy taken by the rebels on the 15th March 1863 at my house..."
The Commissioners of claims stated the following about Jonathan Barton: "At the beginning of the war, Claimant was a man past 30 years old and well-to-do farmer near Larissa in North Alabama. He talked and voted against secession and had a universal reputation as a Union man. In the earliest part of the war, he did the only thing that a loyal man in his neighborhood could do - harbor and pass along Union men who were making their way to the Federal lines. He was much abused and threatened by the Confederates civil and military and was often a refugee from his home. Much property belonging to him was also taken and destroyed because of his position as a loyalist. When Spencer organized the First Alabama Federal Cavalry in 1863, claimant made his way, with four brothers and three brothers-in-law, to the rendezvous and became a sergeant and served one year till honorably discharged. We have made inquiry into his claim and all the evidence and information we have received is to the effect that claimant was a true and notorious Union man from beginning of secession to the end of the war..." The claim was allowed.